In spite of DEVILDRIVER's 15-plus years of existence, during which time the collective has been far more productive in terms of creativity compared to frontman Dez Fafara's previous, notable nu-metal band COAL CHAMBER, some people forever link the vocalist with his former project more than anything. What's clear is that the two projects are vastly different in approach, sound and style. DEVILDRIVER has predominantly been known as a hard-hitting metal band that's essentially an accessible spin on contemporary death metal. The group hasn't been particularly forward thinking, yet there is a sense of uniqueness with its approach. You know you're hearing DEVILDRIVER even after hearing a small excerpt of its music. The prospect of any metal band tackling country and western songs is interesting, to say the least. "Outlaws 'Til The End, Vol.1" features covers from such revered country luminaries as Johnny Cash, Steve Earle, Willie Nelson and Hank Williams, Jr. What's more, there is a star-studded lineup of guest performers including the likes of John Carter Cash, Randy Blythe of LAMB OF GOD, Lee Ving of FEAR, Hank3, Wednesday 13, and Burton C. Bell of FEAR FACTORY. Many purists of either genre are likely to scoff at the idea, but in the era where genre fluidity is the norm, the creative endeavor won't be perceived as heresy by all. In any event, considering that the songs selected are classics, reaching the high-water marks already set becomes a lofty effort at the onset. The notion of such an album surely spurs a myriad of preconceived notions. LAMB OF GOD's iconic vocalist, who appears twice on the album, actually thought it might have been an opportunity for him to employ his melodic vocals—until he heard the music that struck him as having more in common with black metal than country. Indeed, it's clear that it's actually a metal album more than anything. One could say it's a metal album built upon the skeletal structure of country classics, and driven by the spirit of old country and outlaw country. "It's not a country record," guitarist Neal Tiemann said via a promotional video. “It's pure DEVILDRIVER metal. It's got some light moments in it, but it's also got some of the heaviest points of DEVILDRIVER's career." Guitarist Mike Spreitzer suggests that the guitarists' use of slide guitar and lap steel, that are appropriately filtered through metallic distortion, was so satisfying that the group may use those elements in the future for some original DEVILDRIVER material. The band dives right in by paying homage to a member of country royalty with "Country Heroes", a track that features a performance by the original songsmith Hank3 himself. The outcome is enjoyable enough but far from exceptional or memorable. The same can be said of all that follows, in fact. 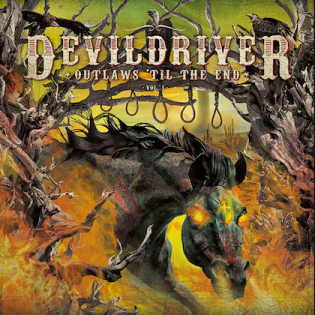 DEVILDRIVER beefs up the source material and even augments it with tasteful and appropriate touches, but "Outlaws 'Til The End, Vol.1" is ultimately okay at best, far from being compelling enough to repeatedly revisit. File under the novelty section.